Driving an Erdmann & Rossi has always been special. A car designed only for its buyer, distinctive and unique. A vehicle like a sculpture. Willi Erdmann opened a coachbuilding firm for carriages on Berlin’s Luisenstraße, presumably in 1897. Eduard Rossi joined the flourishing company in 1906. Rossi had started his career in the automotive industry, and so Erdmann & Rossi decided to begin constructing bodies for motor vehicles instead of carriages. The company subsequently moved to Linienstraße 139-140 in Berlin. Unfortunately, Rossi was killed in an accident in 1909. Erdmann handed the company over to his chief accountant, Friedrich Peters, who shaped the history of Erdmann & Rossi for around 30 years. The company increasingly specialised in the modification and construction of bodies for renowned luxury automobile manufacturers such as Benz, Daimler and Hispano-Suiza. By 1912, Erdmann & Rossi had become purveyor to the court of the Grand Duke of Mecklenburg-Strelitz, and shortly after, the Count of Schwerin. German Emperor Wilhelm II regularly ordered vehicles from Erdmann & Rossi. These were typically official presents, such as the legendary “Torpedo” which was given as a gift to the Turkish Minister of War, Enver Pascha. After 1918, Erdmann & Rossi expanded its range to include bodies for vehicles such as Rolls-Royce, Bentley, Horch, Bugatti and BMW. Every year they exhibited at the automobile exhibition at the Berlin Kaiserdamm. Consistent with the company’s tradition, exhibitions were always of luxury cars, often with a sporty touch, including a great many coupes and convertibles. In the mid-1920s, Erdmann & Rossi relocated to a newly built production facility off the side of Berlin’s Kurfürstendamm. Car bodies designed by Erdmann & Rossi were fitted with a characteristic tag which was usually placed behind the lip of the front fender. Only a small number of coachbuilders survived the economic turmoil of the 1920s. However, with their well-heeled clientèle and the outstanding quality of their vehicles, Erdmann & Rossi experienced no such problems. 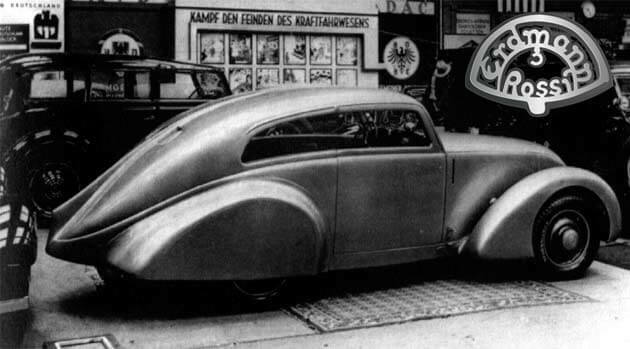 Quite the opposite in fact, and in 1933 the company acquired the equally well regarded Berlin coachbuilder Jos. Neuss and its distinguished customer base, which also included members of the German government at the time. At this point in time, Erdmann & Rossi had around 250 employees. One of these employees, from the newly acquired Jos. Neuss, was a young man by the name of Johannes Beeskow, who would go on to shape Erdmann & Rossi like no other. One of Beeskow’s very first ideas for Erdmann & Rossi became a true sensation. 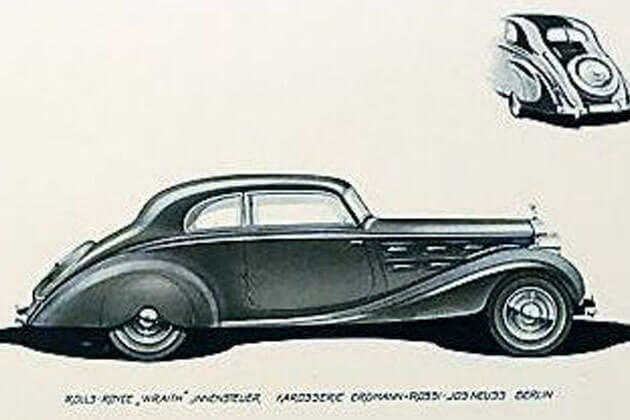 At his suggestion, Erdmann & Rossi exhibited one of the world’s first roadworthy medium-class streamline coupes at the Berlin Motor Show in 1933, by then renamed the “International Automobile and Motorcycle Exhibition”. The base chassis and engine was a Mercedes-Benz 170. The vehicle, upholstered in moss-green leather and painted in gold metallic, stirred the emotions, which ranged from enthusiastic approval to outright rejection. Mercedes-Benz demanded that the Mercedes star be removed from the radiator grill. Within just a few hours, Erdmann & Rossi designed and produced its very own emblem and proudly placed it at the front of the car. 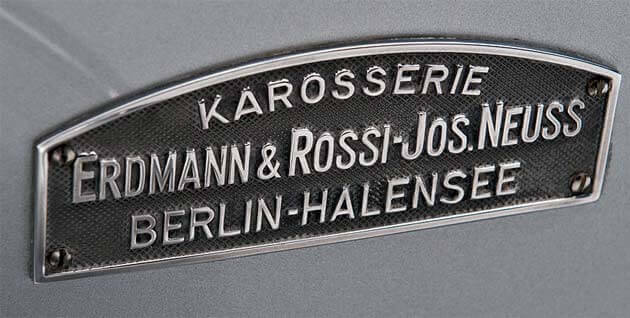 The emblem designed at the time was the basis and inspiration for the current “Erdmann & Rossi” figurative mark of today´s Automobile Erdmann & Rossi KG. Erdmann & Rossi was now firmly established as one of the world’s leading coachbuilders. From the 1930s to the early 1940s, Erdmann & Rossi became something of a legend, thanks to the design and perfection of its coachwork. The company played a significant role in the German sports car design of the 1930s. Johannes Beeskow played with art deco and Bauhaus influences alike. Obvious was also the inspiration that Erdmann & Rossi took from the British sports car industry. High nobility, well-known entrepreneurs, film stars and politicians all drove Erdmann & Rossi vehicles. Wilhelm von Hohenzollern, the German Crown Prince, Prince Bernhard of the Netherlands, Count Peter Radolin, Prince Max of Schaumburg-Lippe, Ghazi I, King of Iraq, members of the then German government, racing drivers Rudolf Carraciola and Bernd Rosemeyer, actors Emil Jannings and Gustav Fröhlich, entrepreneurs such as Heinkel, von Siemens and Polensky were all customers of Erdmann & Rossi. 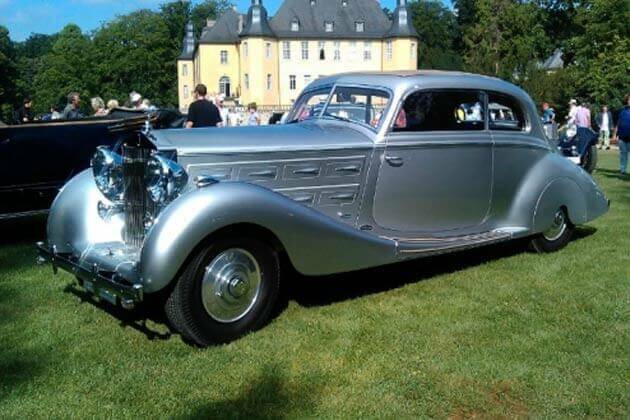 German-born Prince Bernhard, consort of the Dutch Queen Juliana, had his Erdmann & Rossi cabriolet fitted to the chassis of a Maybach DS 8 as a wedding gift from the then Queen Wilhelmina in 1937. 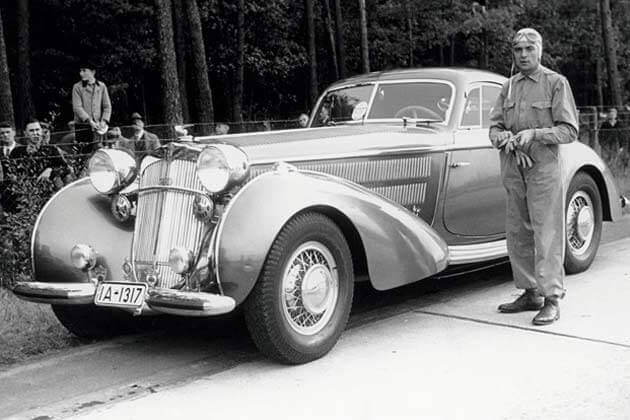 Numerous photographs show Bernhard at official events in his Maybach. The popular racing driver Rosemeyer specified precise requirements for his fish-silver Horch 853 streamline coupe. He commissioned the model on 28 July 1937 by commission number 3001. Erdmann & Rossi vehicles were typically expensive individual pieces that had been tailored specifically to the requirements of the buyer. However, at the end of the 1930s, Erdmann & Rossi was able to begin manufacturing in small series. 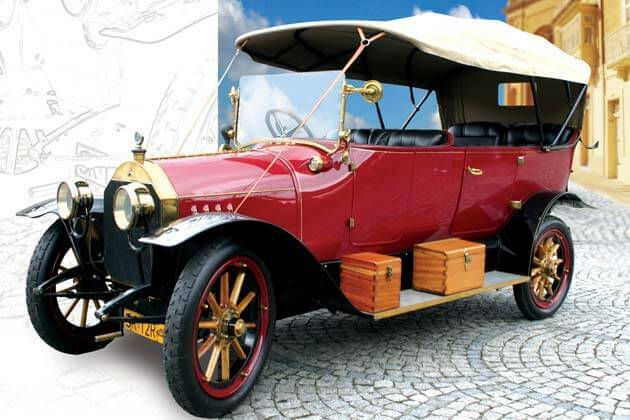 Automobiles with a coachwork by Erdmann & Rossi impressed by their sheer elegance and quality of finish. Designs from before the First World War were defined by individual customer requirements, but already displayed Erdmann & Ross´s own independent lines. Other features included a high amount expertise in the design and finishing of convertible hoods, which were extraordinary for the time, the elaborate reinforcement of bodywork superstructures, and very skilful steel sheet processing. The famous “floating” lines of Erdmann & Rossi were already to be seen in the designs of the 1920s. As a further characteristic, special and multi-coloured varnishes were used, which was quite exceptional for the time. With the entry of Johannes Beeskow in 1933, the profile of Erdmann & Rossi grew further. Erdmann & Rossi´s designs gave even heavy-duty vehicles a unique lightness and less air resistance. Erdmann & Rossi also designed luxurious interiors for aircraft, e.g. the Junkers Ju 52, and the Focke-Wulf FW 200. In fact, the firm took plenty of inspiration from aircraft construction, both in terms of materials used (aluminum) and construction (wind brakes). The Erdmann & Rossi designed door handles, and minimum clearance, are also key features. In the years between 1906 and 1949, approximately no more than 700 car bodies were fully designed and manufactured by Erdmann & Rossi. This rough estimate is based on reliable figures from the years 1938 and 1939, during which Erdmann & Rossi produced around 100 bodies each year. Roughly 10% of all vehicles with an original Erdmann & Rossi body are still preserved today. The production facilities of Erdmann & Rossi in Berlin Halensee were severely damaged during bombardment in 1943, and the idea of continuing production of luxury bodies was unthinkable. After the war, the Soviet high command commissioned Erdmann & Rossi primarily to repair vehicles that had been seized by the Red Army. Nevertheless, Erdmann & Rossi attempted a fresh start after the war. At the Berlin Motor Fair of 1949, Erdmann & Rossi presented a Maybach SW 42 featuring a black convertible body – but times had changed. The market for individual luxury coachwork had shrunk considerably, and Erdmann & Rossi gave up coachbuilding. In 2011, a small team of enthusiasts decided to revive Erdmann & Rossi coachbuilders after 62 years, registering the brand “Erdmann & Rossi” and protecting it in numerous countries around the world. Since then, interest in vehicles with a coachwork by Erdmann & Rossi has grown steadily.